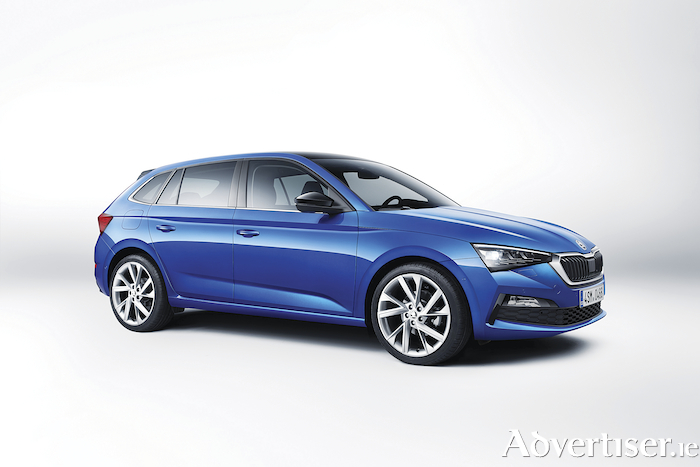 Skoda has revealed further details of the Scala compact hatchback, which replaces the previous Rapid Spaceback and will be the first Skoda model to be based on Volkswagen Group’s A0 MQB platform. The manufacturer tells us that the all-new Scala will arrive in Ireland in June 2019 and is longer, wider, higher, and more spacious than the Rapid it replaces. The Scala also marks the next major development for the Czech brand in terms of design language. The Scala offers an exterior with clearly defined surfaces and alloy wheels up to 18 inches which have been aerodynamically optimised to make the car more streamline. New sculptural shapes, dynamic features, and sharp lines lend the vehicle a dominant and authentic appearance. In addition, the Scala will be the first Skoda production model in Europe to bear Skoda lettering on the tailgate instead of the Skoda logo. The Scala also features LED headlights and tail lights as standard with full LED versions available as an option, which for the first time, come with dynamic rear indicator signals. In typical Skoda style, the Scala offers a very spacious interior, which comes close to that of the Skoda Octavia thanks to its long wheelbase measuring 2,649mm. The Skoda Scala measures 4,362mm in length, 1,793mm in width, and stands at 1,471mm high. In context this is 58mm longer, 87mm wider, and 12mm higher than the Rapid Spaceback model that it is replacing. The Scala also has one of the largest boots in its class with a capacity of 467 litres, which increases to 1,410 litres with the rear seats folded down. The Skoda Scala comes with a choice of four EU6 engines ranging from 95hp to 150hp which include three petrol engines and one diesel. All engines come with direct injection and a turbocharger as well as stop/start technology and brake energy recovery. The 1.0TSI 95hp petrol engine is set to be the most popular among Irish customers, according to Skoda, and is matched with a manual five-speed gearbox as standard. The 1.0TSI 115hp and 1.5 TSI 150bhp petrol version are available with a manual six-speed gearbox or an automatic seven-speed DSG option. The 1.6 TDI 115hp diesel version will only be offered with a seven-speed DSG transmission.